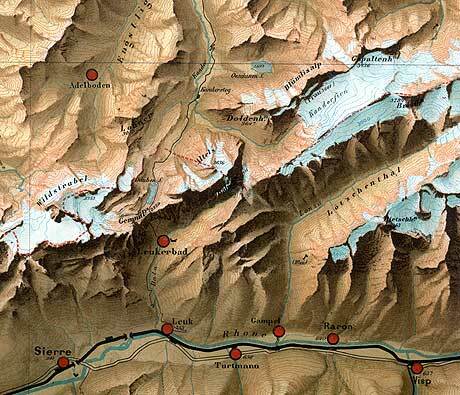 Fridolin Becker (1854–1922) is the inventor of the so-called “Swiss Style” shaded relief map. After finishing his education as a topographer in 1876, Becker worked until 1884 for the Swiss Federal Office of Topography. 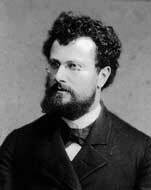 In 1884, he became an assistant to Prof. Johannes Wild at today’s Swiss Federal Institute of Technology (ETH Zurich). From 1890 to 1921 he served as a professor of cartography at the same university. His most significant contribution to modern cartography was the transition from topographic maps to relief images with a three-dimensional appearance. His first printed attempt was a relief map of the Albis ridge near Zurich in 1887. 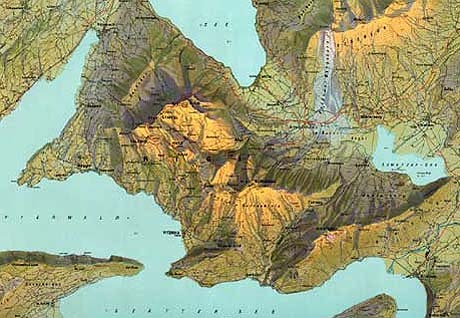 In 1889, the Swiss Alpine Club published Becker’s relief map “Canton Glarus”. After this sensational map, Becker continued to produce different topographic, school and wall maps. “Specimen für die Wandkarte der Schweiz” (Sample shows the Bernese and northern Wallis Alps), original scale 1:200,000, by Fridolin Becker, 1896. Becker experimented with vertical and southern illumination (a very nice example is the map of Mount Rigi) and with hypsometric colouring. He used pale blue and blue-green tones in the lowlands and bright yellowish and red colours for the highest elevations. “Rigi”, original scale 1:50,000, by Fridolin Becker, ca. 1900.